7am. Cat is crying loudly for food, husband can’t find son’s baseball chest guard. Hello, morning. 8am. Finishing laundry, making breakfast and organizing our clothes for later. My husband and oldest son are already at the baseball fields. 8:20am. I’m pestering my middle son who doesn’t eat to eat something, while trying to get my youngest son dressed as he twists and turns in circles to see if I can ‘win’ the getting him dressed game. I blow a puff of hair that escaped the pony tail out of my face and focus. Aha! Got a leg in! But then, the pancake I tried to gently force into middle son’s mouth, winds up on the floor. You win some, you lose some. In between, I’m throwing some last minute items into our overnight bags that are set by the door. After we come back from baseball, we’re outta here. 8:40am. Ready to leave the house. 8:53am. Actually leave the house. 9:02am. Arrive at the local field, just in time to miss my son’s first inning pitching. Apparently 8:50am is the new 9am. 11am. Back at the house, collecting the overnight bags, washing up, grabbing some car snacks and heading right out the door. Noon. Actually head out the door. 230pm. We arrive upstate. 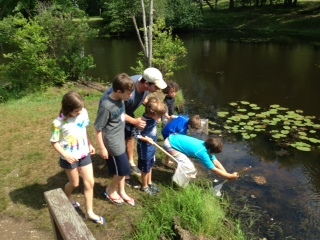 My three boys jump from the mini-van and head straight for the bungalow, where the grandparents and salamanders play. Also, present are my two nephews and niece. My sister and brother-in-law had dropped them off the day before for grandma and grandpa to babysit for the weekend because they wanted some alone time for their 10-year anniversary. Anniversary… hmmm… that reminds me of something. What is it? Oh yeah, it’s my anniversary too. 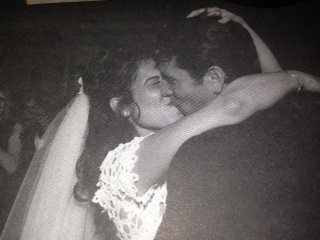 We’ve been married 16 years. Yes, same day. 4pm. With the initial bungalow gorging complete, my husband, three kids, two nephews, niece and I roll on over to the local pond to catch frogs. Baseball, long car ride with kids, frogs… could this day be any more fun? “Why aren’t you guys doing anything special for your anniversary like my mom and dad?” My nephew asks. Damn. That was a way more appropriate answer than mine. 4:10pm. 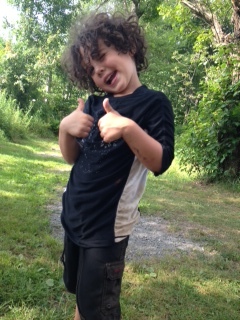 My youngest has fallen into the muddy pond. 4:45pm. 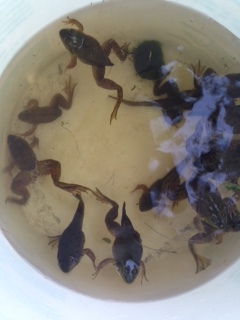 We have a bucket full of fully formed, half formed and deformed frogs. Looking at the majority of one-legged/one-eyed deviants, you have to wonder if there’s a joint up here selling frog legs, an audition for Teenage Mutant Ninja Turtles or if this pond somehow connects to Three Mile Island. Regardless, we also have six giddy, muddy and gross children. I am just grossed out. 5:30pm. 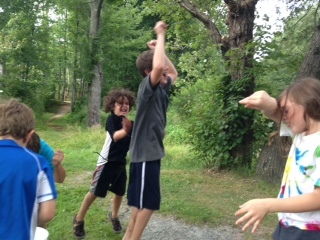 After some drama and a few frogs in danger of losing their only mode of jumping to children more jumpy than them, we successfully released the poor creatures back into their, uh, natural habitat. 7pm. My hubby and I go to our Anniversary dinner. The children are left in the care of grandparents. Ha. Good luck grandparents. 9pm. Anniversary dinner over. Back to the beasts. 10pm. Squashed in a twin bed with my five year-old, I am listening to my husband snore, comfortably alone in the bed across from us. I am not thinking warm anniversary thoughts. 10:30pm. My 8 year-old steals me away into his bigger bed. I’m not sad to leave snoring husband and five year-old who one moment throws his arm across my face and the next has flipped and kicked me in the stomach. Luckily, 10 year-old is fast asleep on the floor, or that would have been the next stop. 11pm. Sleeping. Visions of one-legged frogs dancing in my head. Well, there was dancing… and green is my favorite color. He knows me so well. Sigh. Posted in Crap that makes me eat too much ice cream and tagged anniversary stinks, bungalows, car rides with kids, frog catching, going upstate to catskills, happy anniversary, married with children. Bookmark the permalink. i know, can’t you hear the harps playing? That was a mean trick–the picture of your son is soooo cute, but then you hit me with those crazy awful frogs! Happy anniversary! I’m really worried about those frog. That’s so disturbing. I love the photo at the end of your post. thanks. and it was disturbing…very weird. Happy anniversary! I love that picture at the end, and wish I could see a picture of your whole dress, because it looks stunning. thank you! and i’d send you a picture if i could figure out how! loved my dress! so comfortable,simple and flattering, and off the rack!! perfect!! thank you.. and i think some guys just aren’t so romantic.. but loyal, good and kind beats romantic… but some days, it does make me cranky. can’t wait to hear what he does when you hit 5!! That photo of you two is so sweet. Happy anniversary! I agree, the mutant frogs are super scary. Their pond must be very polluted. Happy anniversary! And I was sort of mesmerized by the frogs in the bucket. Was Homer Simpson lurking nearby with Blinky, the three-eyed fish? HA I was thinking of the three eyed fish too…but am willing to switch to HAPPY ANNIVERSARY! I bet that dress was beautiful….same day? double wedding? or different years? thank you! and yes, it’s my 16th anniv and there 10th. they picked our date. don’t ask me why. What an awesome last picture. That sounds like a kids paradise. I was quite the toad catcher in my day. But those frog look huge. I’m sure I would have loved it. We had a pond out front of our house and I would return home wet, muddy and smelling of sulfur. Happy, happy 16th. Many, many more. The frogs are pretty disturbing. But happy anniversary! My husband and I just celebrated 15 years. Happy anniversary to you! our 14th anniversary was in early July and we celebrated by sharing a cabin with the inlaws so I get this. We don’t do romantic in our household either. Our most recent dates have involved tractor pulls and then eating a late meal at Denny’s. Sharing a dinner for two after sixteen years of marriage qualifies as romantic. As for the fireworks that are supposed to follow, who has time for that? it’s true..and you’re right. we were never a couple big on romantic drama. still, sometimes i’m still getting used to that i have a big boy and three little boys, it’s baseball and frogs and bugs all the time. oh my.